The new Dior So Real design rewrite the rules of the timeless aviator style introducing round shapes. 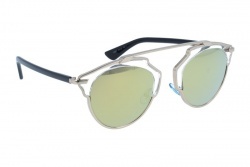 A destructured pantos shapes and semi-mirrored lenses make these unisex sunglasses so appealing. Their single bridge gives these chic spectacles a very futuristic look. 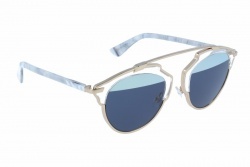 Their frames are made out of acetate (thr stems and in some models, the frontal part) and metal (the frontal). They have aviator shape and they are available in a wide range of colours: havana, green, blue, silver, transparent or black. All of the models have organic lenses but some of the glasses also have mirror coatings and others have a single colour coatings. Models such as So Real APP, I1A, U5S, BOY, B1A and A00 match the frame’s colours with the details in the stems. Each model adds innovative nose pads with cheerful colour's combinations (blue, green, yellow…). 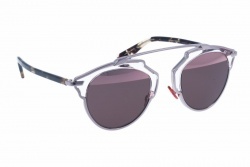 The new Dior So Real are original sunglasses and manufactered with high-quality materials. 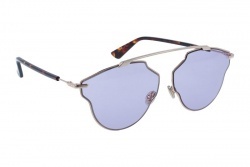 These glasses create trend and mark the new style of the prestigious Dior brand. Modern elegance together with design and exclusivity are the distinguishing mark of this new and groundbreaking model. As it happens with all Dior glasses and lenses, the Dior So Real lenses guarantee 100% protection against ultraviolet rays.